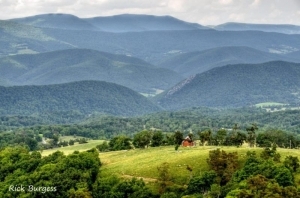 Back-Allegheny Mountain is the first principal ridge west of Allegheny Mountain in the Allegheny Mountains of eastern West Virginia and is one of the most distinctive landforms in the Mountain State. Its steep eastern face forms a mountain wall some 20-miles long. Back-Allegheny, like other ridges in the Allegheny Mountains, rises to more than 4,000 feet above sea level. Back-Allegheny Mountain parallels Cheat Mountain in its elongated course, but at its southern extent the two mountains join in a mass capped by a broad summit, Thorny Flat, the second-highest point in West Virginia and the location of Snowshoe Mountain Resort. At its northern extent, at Gaudineer Knob, Back-Allegheny continues northeastward as Shavers Mountain. At 4,842 feet above sea level, Bald Knob is the highest point on Back Allegheny Mountain and third-highest point in West Virginia and the Allegheny Mountain system. At Cass Scenic Railroad State Park, trains transport passengers to the Bald Knob summit. A firetower on the summit and an observation deck have been built on the eastern side of the mountain for the railroad. At 4,840 feet above sea level, the southernmost summit on Back-Allegheny Mountain is Thorny Flats, now site of West Virginia’s largest ski resort, Snowshoe Mountain. Snowshoe is among the most distinctive ski resorts in the U.S. in that hotels, restaurants, and outfitters shops are located on top the mountain rather than at the base of the ski slopes. Gaudineer Knob rises to 4,439 feet above sea level at the northern extent of Back Allegheny Mountain. Is is also the southern extent of Shavers Mountain. The two mountains extend end-to-end together in one long wall more than 50 miles long. At Gaudineer, in the Monongahela National Forest, the U.S. Forest Service has established the Gaudineer Scenic Area, which contains more than 50 acres of virgin red spruce forest.